missing u marimari...can't believe it's been 1 year. Just stunned everyone, but we keep on moving. Risa Niigaki has grown into a beautiful young lady. Everyone staying strong. I'm just keeping the positive attitude, putting a smile on my face like Kyle. Mourn you till we join you, lil homie. 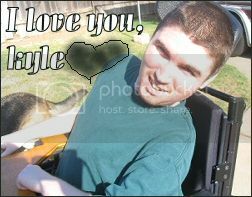 SO, everyone, put up your marimari sigs to show a lil love to Kyle on this day of remembrance. Re: missing u marimari...can't believe it's been 1 year. Neither do I, I sure can't believe its been a year already too. You know, certain things in life are too important to forget, and the relationship that marimari had with everyone here is definitely worth remembering. I'm sure guilty of taking my friends for granted sometimes, I've no excuse for doing so. I remember upon hearing the news, how we were all together on the IRC, with one thing on our minds - how much marimari meant to us, how much he cared for everyone here, and how much he shared everything he had with us. It didn't matter to him. His sharing habits didn't discriminate. If he could help out, he'd help out. If he could share, he'd share. What an amazing way to live life! I only wish that I could live the rest of my life with the unconditional love that marimari shared with us. I encourage everyone reading this to take a moment and find someone, anyone that you know. If you've not gotten along well with them lately, offer to make peace. If you have been getting along great, tell them that you appreciate their support. If you haven't spoken with them in a long time, offer to catch up. And if you can't find someone you know, find someone you don't know, and make a new friend. Marimari did it here, every single time he was logged in. How many lives will you affect in your lifetime? I still remember how absolutely speechless I was after reading the news. A few hours later I probably cried more than I ever have since I was a baby. All of us who frequented IRC back then, knew just how tearful those days were. But enough about that stuff. What I remember the most about marimari was pretty much all the positivity he spread. I actually don't remember him saying anything really negative. He was one of the reasons why I loved to go on the IRC so much, with his epic pic spamming and his willingness to help anyone in any way he could. I really couldn't help but be a little mad that he never mentioned anything about his condition, as maybe then I could've done more to help him. But I guess it's because the internet was really the only place where he was treated like everyone else. He was only human after all. I'm just really thankful I got to know him, even if it were just for a few short months. I wasn't around at the time, and I'm sorry I wasn't. He sounds like a great person and wherever he is, I hope that he's happy and being treated well in return for all the lovely things he did in his lifetime. I'm also sorry for everybody who lost such a dear friend, but everybody should be glad that such a great person was able to make an impact on their lives, no matter how large or small. marimari was THE kindest guy ever. He never said an evil word about anyone (including H!P members), never offended a single soul. And he was so cute and so innocent and wouldn't get into the pervy chats And yes, he would share everything. I genuinely think the world would be a much better place if more people were like him... And I wish I was, too. Can't believe it's been a year already. Time really passes quickly. I miss him a lot as does everyone else, and Risa truly has become beautiful. marimari was one of the most helpful people on this forum... may he rest in peace. I only knew him briefly but I was stunned to hear the news and only then realised how integral he was to this community. My only regret is that I didn't get to know him better. I know..I've been thinking about it last night. I remember when I heard the news last year and I was in shock. Someone who I haven't known that had made a small impact for me over the past year through some of the worst times of my life. It's such a good thing that he still resides in us all today. I was listening to our memorial radio show to him last night and wished that we could make another one in his honor. It brought so many memories and how some of the music he enjoyed listening to got me started to like some of the same bands today. I will admit, that I'm still the same as I was last year, but knowing that he would have wanted me and everyone else to go on makes us that stronger. I'm glad to say that he's a good friend of mine, even though I never met him. I believe everyone here can agree with me. I can also say that if Risa ever met him, she would say the same thing. I also believe that he may have got a chance to see Risa during the past year(maybe you guys know what I'm talking about). Thanks again to Kyle for impacting all of us and your everlasting gratitude that will never die. I wasn't a member when it happened so I didn't know him. But from I've seen around the board, and how others described him, he must've been a great guy. It's too bad he had to go, especially like that. It's great you guys are keeping his memory alive; I'll don the marimari sig for a day. I hope he rests in peace. I didn't join the HiP movement til the near end of last year so I can't say that I was fortunate enough to meet Kyle Bouvier aka marimari, although I wish I would have gotten the chance to. From reading all the things said about him, he sounded like a great guy and it's good to see how everyone showed their support in his passing. I lost a friend of mine whom I worked with last year as he too passed away after a lifelong battle with muscular dystrophy. Although people with MD are usually confined to a wheelchair and aren't able to do some of the things physically that a lot of us take for granted, I learned from my friend as I'm sure you all did with Kyle, that doesn't stop them from doing what they love to do and enjoying life. I'm sure Kyle has had a better year than ever before where he is now. May he RIP. I wasn't a member at the time, and I'm sad I never got a chance to know him. But I think even the newcomers can still see his legacy on the board and it's great that people are still continuing it. He sounds like he was really great person and I hope that wherever he is, he still gets to see Gakisan. Rest in Peace. Every time I go to the Risa pic thread, I think "wow, Kyle would have been so proud". Then again, 90% of the pics there would have probably been uploaded by him. And Risa has a very special guardian angel in Kyle, because I'm sure he left us just to begin his new job as Guardian Angel for Gakisan. His kindness lives in this community. Still miss you, Kyle. i wish i had more to say here... i was a lurker for quite some time here and while i never got to know him, i saw him post around and he seemed like a nice guy. it was really sad that he had to go. RIP Kyle. I knew there was a reason that out of all the days I've been here, today was the first day I could finally magically connect to the internet from my pc. I still remember the day I got the news. I never thought someone I barely knew could make me cry so hard...maybe that was the reason I was crying in the first place. I'm truly sorry for not getting to know him better, when I had the chance. I hope I'll never repeat the same mistake ever again. We're truly blessed to have been in contact with him. May you rest in peace, Kyle. One year now.....time flies like woah..
well. Rest in Peace marimari. Everyone in JPHIP has good memories of him. So REST IN PEACE marimari. I didn't really know the fella, but he seemed like a cool cat. Rest in Peace friend. Oh man .... this year really flew past.I remember how I felt sick for like a whole month. never forget his incomparable personality and endless kindness. Rest in Peace marimari ! I like Sailor Moon and other stuff.